For many of a certain age, anything that occurred four years ago probably feels like last Thursday. For parents, a revival of author E.B. 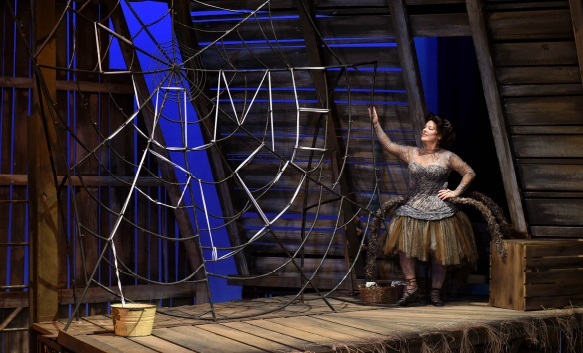 White’s charming modern children’s classic, Charlotte’s Web at Childsplay may initially seem a little too soon. After all, it was the company’s opener for its 38th season in 2014. And now here it is again, revived to begin its 2018-19 season. But for its intended audience, four years is an eternity. 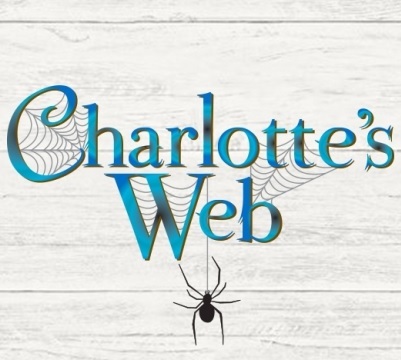 For ages five and up, the majority in the house will never have seen Charlotte’s Web before. And for those whose parents treated their children to the play in 2014, there’s probably little to no memory. Remember, before the advent of videotapes and home entertainment, Disney did much the same with their classic animated features; every few years Pinocchio, or Lady and the Tramp, or perhaps Cinderella would get a new release for a new generation. If it wasn’t for DVDs and Blu-Rays, they’d still be doing it. While this current production is based on the same Joseph Robinette adaptation that was used in September of 2014, if you’re a parent who recalls the previous presentation, what should strike you this second time around is how different the show feels from the outset. 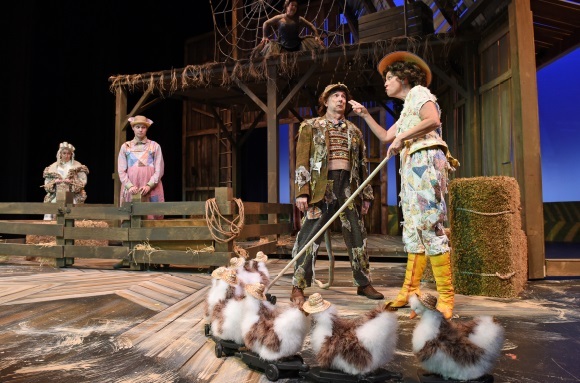 With a new scenic design from Douglas Clarke, a new cast along with some familiar faces, and new direction, this time from David Saar, 2018’s Charlotte’s Web at Childsplay has an energy as fresh as anything you may be seeing for the first time. And it’s very funny. 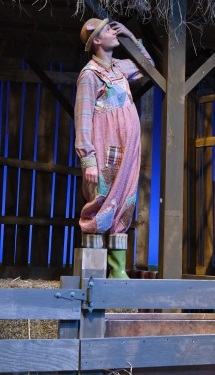 In addition to Sedona, other new cast members to Charlotte’s Web include Tony Latham, remembered for his fun portrayal of Humbug in Childsplay’s The Phantom Tollbooth, here as Fern’s brother Avery; Nathan Alfred, last seen in the excellent The Snowy Day, as Farmer Zuckerman; and Tommy Strawser, returning to Childsplay for his sixth season as Wilbur the pig. “I’m gonna like it here,” Wilbur insists with all the joy and playful innocence that Strawser succeeds in bringing to the role. But best of all is Debra K. Stevens returning as Charlotte the Spider. And just as before, Debra brings that same warm, affectionate quality to the role as she weaves those famous words on her web in order to make Wilbur appear as something special and to save him from Farmer Zuckerman’s ax. 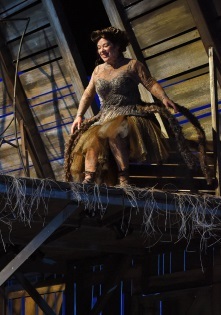 When we first see Charlotte, there’s a magical quality to her appearance, appearing for just a few moments, perched on the upper level of the barn by her web, looking down on Wilbur like a mysterious, nurturing, guardian angel. “I’ll be a friend to you,” Charlotte lightly calls from above when Wilbur laments to himself that he has none. Though, perhaps the most important difference to this delightful season opener is how it looks at the company’s new location. Having started for a brief period more than 25 years ago at Herberger Theater Center in Phoenix, Childsplay now circles back to join the other resident companies that regularly play at the valley’s most prestigious and appealing valley theatre complex. And it’s a positive move. While Tempe Center for the Arts remains a first-class locale for theatrical presentations, one of the unspoken issues for Childsplay while based in Tempe was how dwarfed many of its productions occasionally appeared when performed on the venue’s expansive stage, the previous Charlotte’s Web included. There was often too much available space. Now performing on the Herberger’s less cavernous forum, Douglas Clarke’s scenic design fills the stage; it’s a perfect fit. And Childsplay, I’m thrilled to say, looks right at home. 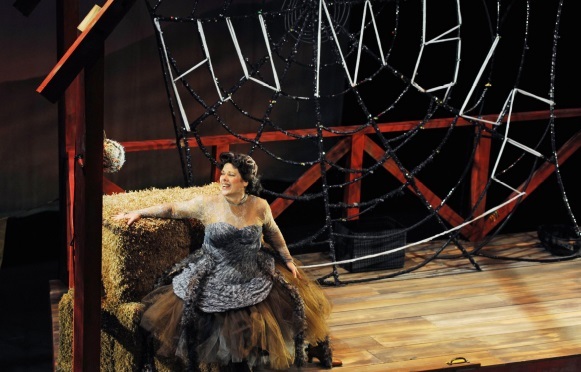 Charlotte’s Web continues at Herberger Theater Center in Phoenix until October 14.